Hoping for something medium longish today. My leg and derrière hurt pretty badly after yesterday's QoP. But I hope a run will help to loosen things up a bit. Chick:It is so nice to have to the option of not only flat but warmer and no ice to run along and to see the sea in all its glory.Shame about all the people about especially dog walkers on those extended leads:-( also it is the worse place ever for dog poo it is so unlike any other part of the country I have come up against. I hope it is not slippery out for you. Cold here again too. I don't like winter running. Hazel - your track sounds a little deadly with the sudden deceleration required. Hope it's not icy for your runs chicksta and Poppy. I take the same approach when it's slippery chicksta, take it easy and try to stay on my feet. Are you on holiday OH? Lyrics - tugging at the corner of my recall but I can't get them. Hazel thanks so much for those tips. Foot is quite sore this morning (I guess due to the small number of exercises I did yesterday. Arms are in agony and back is aching! I've now booked transport within the airport so hopefully I won't need to propel myself he whole way through that tomorrow. WP hope you get rid of the cold soon. Be careful in the ice out there everyone. OH - you be careful on the ice! Hazel / Ale - 100s generally all about form (I usually advocate something like mile pace) and use the first 20-30m to accelerate up to that pace. 150-250m intervals then the effort is reduced but still at something like 3k pace, again with the emphasis on form & technique. Dustin: I don't disagree...but anything over 100 should be called something else. It feels even colder out there this morning and the puddles are frozen hard, no wind and no ice though so I shall wrap up warm and head out. I don't think the cold is helping my hamstring. I don't like winter! Hopefully you won't need the crutches for too long emzap. I was once non weight bearing for three months and had arms like Arnie by the end of it! Enjoy the lunchtime run Dustin. you seem to be building nicely Alehouse. LMH: Well, if winter is like this, I love it. No wind, clear skies - just the stars and me. Awwwww. It was a teensy bit slippery. I ran very slowly and carefully at first but once I realised footing was ok I relaxed and had a quite a lovely run. Hamstring is getting better. I could feel where I'd been prodded though. Poppy: sounds like proper dog-poo dodging there. Well done on the PB. Em: Enjoy your last day in ZA then. Hope the return is not too stressful. Hazel/Dustin/Ale: I never worry about pace when I do strides. I just a bit faster (doing the accelerate/float/decelarate thing) and tend to focus on one thing at a time when I do strides. Could be cadence, light feet, engaged core, straight upper body, engaged glutes, etc. 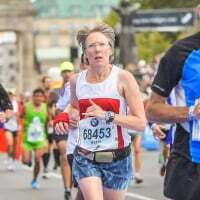 Hazel: Hamburg marathon is not a bad one. It's not on par with London or Berlin though. I think average participation is 10000 runners plus 3000 half marathon runners but the start is always congested. Usually takes 5k or so to be able to hit race pace. On the other hand it'll prevent you from going out too fast. Kipchoge ran it in 2013 and smashed the course record. Coincidentally I set my lifetime PB in the same race He wasn't quite as famous back then. Just another fast Kenyan. Course is pancake flat and fast. It's well supported for the majority of the route, however km 26 through 30 can be rather bleak. You run through deserted office areas direction airport and then back into town. 30 to 35 is quite pretty and green and if the weather is nice, people will be out picknicking and BBQing. And as you get to 35 expect mayhem. There will be tons of crowds and it'll be loud. The next few ks will be quieter running through the posh areas around the Alster and the finish is a red carpet one. Weatherwise it's usually quite warm but there were freak years too with high winds, hailstones and sleet. Wind is a constant factor in Northern Germany. But the route is twisty enough so that there should be sheltered bits and tailwind bits. emzap I hope your foot eases up soon, it must be blooming hard getting about! LMH I love your easy lover comment, extra lyrics going on! Enjoy that easy! Chicksta my sciatica is ok now, yoga helped but my longer run weds eased it massively too! WP enjoy the easy and may your nose stop dripping! have a great weekend all I am hoping to get Cleo to junior park run, next to my club but I feel she may want an lay in on Sunday! Glad you enjoyed your run chicksta - too cold for me really, I think it's aggravating the hamstring as when I'm walking it doesn't feel too bad at all but I'm much more wrapped up. One good thing about the low temperature is that I'm comfortable wearing compression tights under my jeans all day. Which race Wabo? Glad to hear that your bruises, aches and pains are improving. LMH, I am plodding round a park run first thing to support a mate who is hitting 100 p runs. The Chingford League 5 mile xctry in the afternoon. I am so glad the back is better! I am debating what to wear for the proper race as it will be cold! That sounds like a busy day Wabo. Wear less than you think for the race - you'll soon warm up, as long as you can stay covered until as close to the start as possible and get something on quickly afterwards. Cold here, and it certainly was for the outdoor PE lesson that I taught! Then icy rain for my short run. Glad it was an easy day. Good advice re strides, Chick, and exactly the sort of thing that I was taught to focus on at coaching courses in the 70s (at the same time as being advised to not exceed 80 metres because of deterioration in form which is likely to happen on later reps if the distance is further). Thank you for the building nicely comment, LMH: I hope you haven't spoken too soon! I would be progressing at an even better rate, I suspect, if it wasn't for my suspect Achilles and in particular my calf. I have just been in contact with my GB team doctor friend re ultra-sound machines and he suggests that I get one as long as I follow his instructions. Gloves are good Wabo (I use fingerless ones when racing) and maybe a buff? From yesterday's thread: espen you are lucky living in Norway, lovely country and friendly people. I did a skiing tour many years ago somewhere up on the Hardangervida (sp?). Bit pricey though (says she who lives in Switzerland). Please be careful on the ice anyone affected, one set of crutches is more than enough. Good luck to the parkrunners and Wabo for XC. And I think Chicksta is racing as well? Thanks for the Hamburg details Chicksta I will pass them on. I don't think the guy is looking for a particular time other than sub 4. Buffs are great things LMH. Why: late Xmas pressie. Do me good to have a break from running for a couple of days. Last hard: the first few metres on skis toay as it was my first outing of the season. 10 miles run on Great Trossachs Way.